This week has been a decisively Twin Peaks heavy geek out on my end. Probably because I saw the teaser trailer (see item 2) and got all excited. I hope y'all like Twin Peaks. Or at least are intrigued by it! I like watching pole videos for a lot of reasons. First, I like seeing what kind of moves and tricks are in my future. Second, everyone is just such a great performer! Third, I like getting ideas for flows and transitions for when I get my pole at home and am able to pole every day just for fun and practice. I guess YouTube saw that I had been watching Twin Peaks related content, and showed this to me as a recommended video. It's amazing, and the way it is cut fits perfectly with the song. Worth a watch, whether you like pole or not. This is the teaser trailer that sent me down the rabbit hole this week. Because, holy crap! I'm so excited for the new Twin Peaks series! A friend gave me their Showtime login information just so I could watch it as it goes come May. Diane is a podcast I recently discovered, actually, after they favorited one of my fangirl Twin Peaks tweets. Every episode, they discuss an episode of Twin Peaks, including trivia, continuity, allusions to literature and other media, critical analysis, etc. I love learning new things and listening to their thoughts on the episodes. They also give a quick synopsis of the episode so you can follow along even if you haven't watched the episodes recently. There are spoilers, though, so if you've never watched Twin Peaks, my suggestion is to watch the episode they discuss before listening. If you have trouble with UK accents, however, this may not be your cuppa. If you know Twin Peaks, you know how important pie (and coffee) is in the show. 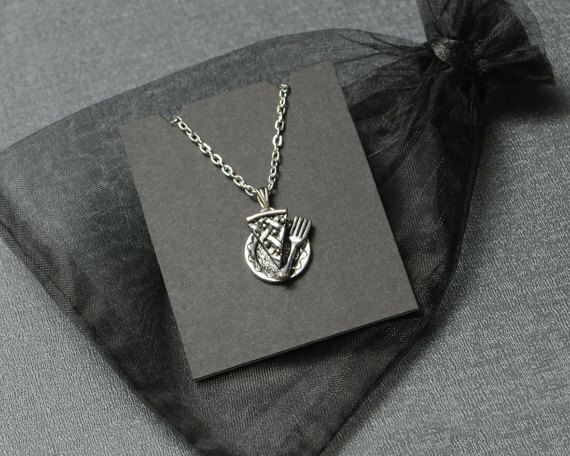 And this is the perfect Twin Peaks necklace. I love kitchy jewelry. It makes me happy. I especially love kitchy jewelry that reminds me of fandoms I enjoy. For instance, one of my favorite necklaces is a bee on a honeycomb because it reminds me of The Secret World. I'd love to get this necklace one day just because. I've also been spending a lot of time listening to this playlist in between podcasts when I need more of a "focus background music" type thing instead of a "I can listen to podcasts and work" type thing. The soundtrack to Twin Peaks is unique, and expresses so much about the show. It's definitely worth a listen.